Ford Super Duty pickups have become notorious for dripping oil. 7.3 Powerstroke common oil leaks are especially well known. Many of the more common oil leaks are the result of poor maintenance and outright neglect over time. However, just as many 7.3 oil leaks are due to inherent manufacturer design and component choices. Decisions that require preventative maintenance and parts replacement over time. Careful though — some of the more common 7.3 oil leaks turn out to be fuel leaks. Leaking diesel that runs through the engine valley and down the back of the motor. On the way, that fuel collects dirt and oil from the valley. Then it runs out the valley drain hole and down the rear of the engine, making it appear to be an oil leak. The most common 7.3 Powerstroke high pressure oil pump (HPOP) leak happens when one or both of the HPOP O-rings on the oil line fittings fail. The fittings "click" into the HPOP and the heads and require a special tool to remove and reattach. A leaking HPOP O-ring won't necessarily throw a CEL or cause noticeable drivability problems until enough oil is lost to reduce flow to the injectors. But, by the time a CEL comes on, you're about to start walking. So pull over immediately and inspect your engine valley for oil. The reservoir should have oil all the way up to within 3/4" to 1" from the top of the inspection plug. The injectors actuate by using high pressure oil in the oil rails. If the pressure's low, they won't operate efficiently. Down below 500psi of startup pressure, and they might not fire at all. It's a good idea to check the valley frequently. It's where numerous "leaks" start and it could save you a long walk to the nearest service station. A lot of oil in a short amount of time points to the EBPV (Exhaust Back Pressure Valve) on the turbo pedestal or more-likely the HPOP line fittings. The HPOP fitting o-rings (Amazon Link) are a well-known failure point and cause for a leaking HPOP. Do yourself a favor and if you see even a little oil leaking around them, perform some preventative maintenance—change the o-rings before they fail and dump all your 7.3's engine oil into the valley. Sometimes the plug on the rear of the HPOP leaks (See location in diagram above). Run your fingers around the head of the plug and see if there's fresh oil. If you find even a small amount, don't take chances — a preventative o-ring change on an HPOP rear plug leak will save you a walk home. Though the "non-serviceable plug" is a very uncommon leak, it can happen. It's on the underside of the HPOP. Replacing the non-serviceable plug isn't trivial — it requires fuel bowl and HPOP removal before you can replace it. A leaking o-ring in at the HPOP rear plate is very uncommon. Look to this location after you've inspected the oil discharge hose fittings, the rear plug and/or the "non-serviceable" plug. The rear plate requires an 8" pair of c-clamp pliers to remove the retaining c-ring. Riffraff Diesel sells a replacement rear plate o-ring seal. 7.3 oil leaks at the HPOP gaskets are also pretty uncommon. There's one between the the HPOP reservoir top cover and bottom oil reservoir — the HPOP "Reservoir Gasket." Another one — the HPOP Mounting Gasket — sits between the HPOP and front engine cover. 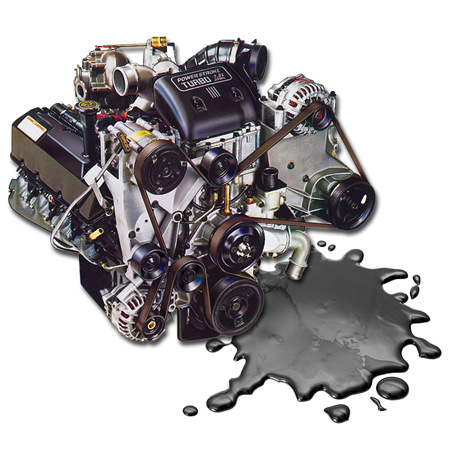 For a more detailed look at fixing HPOP oil leaks, including parts and torque specs, see the article on Fixing 7.3 HPOP Oil Leaks. If you have a few drips on your driveway in the proximity of the front crankshaft seal, you might have a camshaft position sensor leak. The oil from the CPS can drip down on the damper pulley. That pulley will throw oil all over the place. If you think you have a CPS o-ring leak, Diesel O-rings sells a very inexpensive o-ring to reseal it. Your oil gallery rail plug at the front of either cylinder head. Check the o-rings on these very large oil rail plugs for leaks. A 7.3 powerstroke oil cooler leak usually originates from the oil cooler o-rings or an oil cooler gasket. Find your oil filter and trace it to the oil cooler assembly. Check for leaks around the ends where the oil cooler attaches to the engine or at the o-rings in the center of the cooler. Of course a leak at the valve cover gasket on the outside of the driver's side can run down and cause a mess as well. The most common passenger side 7.3 oil leak is where the oil dipstick enters the oil pan — the dipstick adapter. You'll see a large nut on the rear passenger side of the oil pan. As a quick fix, you can try tightening that nut a little. But be careful, you can over-tighten it pretty easily and then it won't seal again. It's a more complicated job to replace the internal dipstick o-ring. That's because an untimely slip and you'll drop the internal backing to the nut and probably the o-ring down into the oil pan. And that will require engine removal to retrieve it. Probably a job better left to the pros. And just like the valve cover gasket on the driver's side, the outside of the passenger valve cover can leak at the gasket as well. Unfortunately, anything more than an annoying — small — oil pan gasket leak is going to require engine removal to fix. Sadly, the labor cost to remove the engine and install a new gasket on the oil pan is going to make you want to drive your Powerstroke off a cliff. Or, as many others have tried, just let it leak, put silicone over it, or even JB Weld the entire thing in an attempt to slow the leak down. We talked earlier about HPOP leaks — probably the most common top-of-engine oil leak. Here are some other leaks that will fill your valley with oil. A very common oil leak is at the turbo pedestal o-rings. There are 4 of them in 2 different sizes — two (black) o-rings on the top, and two (yellow) O rings on the bottom. And you'll have to R&R the turbo pedestal to replace them. Honorable mention goes to the EBPV (Exhaust Back Pressure Valve). It likes to leak a lot also. Attached to the front of the turbo pedestal (See diagram above), the EBPV can make it seem like the pedestal itself is leaking. Spray the pedestal down with some simple green. Then clean the pedestal before deciding which one — turbo o-rings or EBPV — are leaking. Another "top-of-engine" oil leak location is around the inside of the valve cover gaskets — toward the valley. Try torquing down the valve cover bolts to spec before diving in to replace the 7.3 valve cover gaskets. Top of engine oil leaks can also come from the two plugs installed near the rear of the engine — into the head. These two cylinder head plugs face into the engine valley and are oil drain ports. They're located just below the valve covers. If one of the plugs comes loose or the o-ring fails, it can leak a lot of oil into the valley. That'll cause a loss of power and/or injectors that won't fire. The other plugs on the oil gallery rails are the oil rail end plugs. The end plug o-rings can wear out and leak or the Loctite 277 can fail and cause the plugs to get loose and leak. The valley sits on top of the engine block behind the HPOP and ahead of the turbo pedestal. With a so-called "Valley of Death" leak, 7.3 engine oil will pool up in the "V" between the two banks of cylinder heads and valve-covers. There's a small drain hole at the back of the valley on the passenger side. Any fluid that leaks into the valley can escape through that hole, out the rear of the valley, and down the back side of the engine. That hole has caused many needless (and expensive) rear main seal replacements as oil from the top of the engine appears to be coming from the bottom of the engine and the rear main seal. There are several culprits responsible for a leak in the valley. Even the valve cover gaskets deteriorating and seeping oil can cause dirt and grease-mixed oil to get caked all over the valley. In some cases the CCV — Crank Case Vent — can leak oil into turbocharge pipes which eventually finds its way into the valley. The IPR-Injection Pressure Regulator is screwed into the back of the HPOP-High Pressure Oil Pump. It's seated and sealed with an O-ring. That IPR o-ring can wear out or get damaged in a poor installation and then leak as well, causing oil to seep into the valley, eventually making its way by gravity down the backside of the engine. Finally, the rear main is one of the LAST places that fail or leak on 7.3's. Because of the placement of the high pressure oil pump, a 7.3 HPOP leak can appear to be a rear main seal leak. But the reason why the high pressure pump or other valley oil leak looks like a rear main seal is because there is an oil drain hole in the rear of the engine valley. 7.3 valley oil leaks will cause oil to run down the back of the engine and appear to be coming from the oil pan or rear main seal leak. There are also the large oil rail plugs on the back of the heads. The o-rings in these are known to leak as well. Now you need to pinpoint where the leak is coming from. Clean out the valley of all the oil and dirt using some simple green and a garden hose. Do not take it to the car wash or use a high pressure hose. See if you can visually see exactly where your oil is coming from. The Rear main seal is the last place you should check if you see engine oil coming down the backside of your engine. More likely oil in your valley is draining out the rear of the valley and down around the bell housing, appearing to be a rear main seal leak.